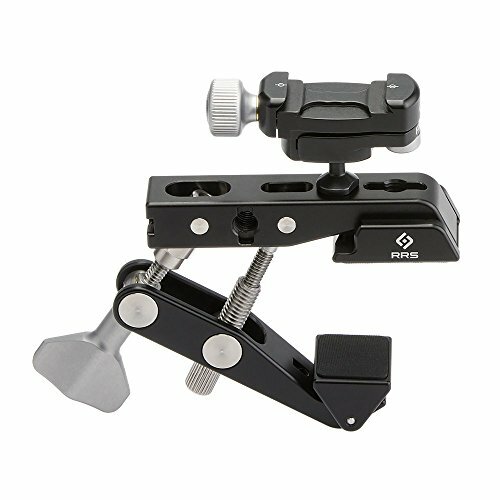 Our BC-18 Micro Ball or BH-LR ballhead mounted to our Multi-Clamp creates a rugged "go anywhere" ball & clamp kit. The BC-18 Micro Ball can be mounted in the hole on the Multi-Clamp jaw, or use the included 3/8" to 1/4" reducer bushing to use the other holes. The BH-25 LR ballhead can be mounted into any of the 3/8" sockets using the included 3/8" studs. Now you can mount your camera directly to poles, fences, tables, and more! There are 5 threaded holes in the Multi-Clamp: four 3/8"-16 threaded holes, and one 1/4"-20 threaded hole. Use these built-in sockets to mount the BC-18. Add the optional Flat Surface Adapters to securely mount the Multi-Clamp to flat surfaces. If you have any questions about this product by Really Right Stuff, contact us by completing and submitting the form below. If you are looking for a specif part number, please include it with your message.